June 29th, 2017 By: GGT Category: 2017/12 release, Figure News. 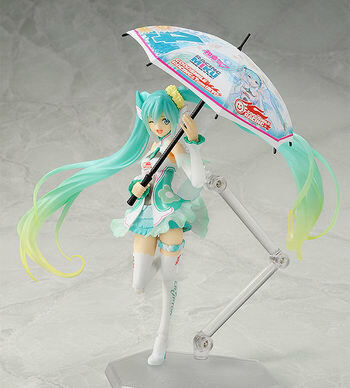 GoodSmileRacing (Good Smile Company) is going to release the figma SP-097 Racing Miku ( レーシングミク ) 2017 Ver. action figure from the official mascot of GoodSmilleRaching & TeamUKYO. Bundled with the GoodSmileRacing 2017 figma course personal sponsorship packages. Will be released in December 2017. Figure around 135mm tall. figma course personal sponsorship package starts from 8,000 yen to 15,000 yen. GoodSmileRacing Online Store exclusive. figma Racing Miku 2017 ver. 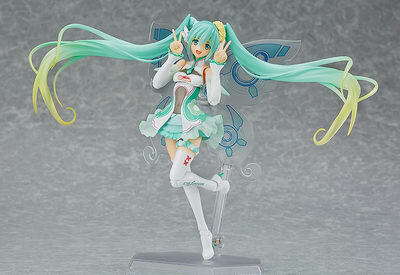 A figma of the official character of the 2017 Hatsune Miku GT Project! 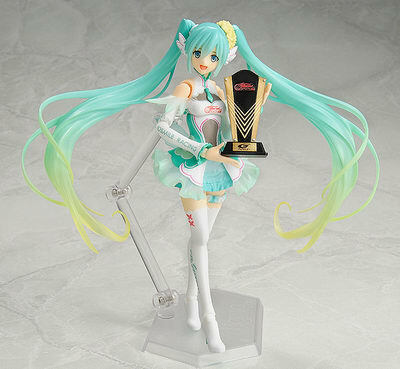 The 2017 edition of the official character of the 2017 Hatsune Miku GT Project, "Racing Miku", is joining the figma series! 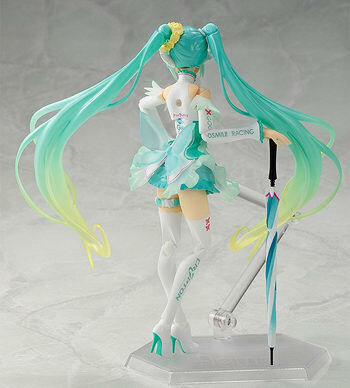 The fairy-like appearance of the 2017 Racing Miku illustrated by Tony has been faithfully preserved. You can display her in the pose from the official illustration, or in various other original poses of your choice. Large wings, small wings, both an open and closed parasol and a trophy from the victory at Okayama circuit are all included. This product is only available to personal sponsors of the GOODSMILE RACING Team. The Personal Sponsorship 2017 figma Course (8,000JPY/15,000JPY) can be applied for in certain stores. Please visit one of our international Partner Shops below or your local hobby store for more information. · Applications made in stores will have all course items sent together in November 2017.